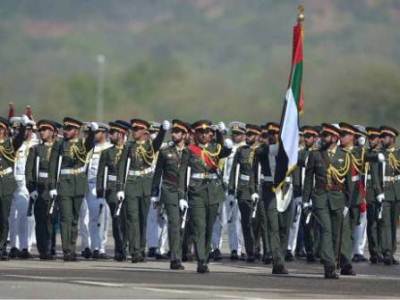 Islamabad: More than two dozen elite officials and soldiers from UAE’s armed forces demonstrated their military abilities at the 78th Pakistan Day parade in Islamabad. The performance of UAE military contingent was highly appreciated by Pakistan’s top civil and military leadership and lauded by the print and electronic media. The UAE delegation at the Pakistan Day parade was led by Mohammad Ahmad Al Bawardi, UAE Minister of State for Defence Affairs, and Hamad Obaid Ebrahim Al Za’abi, UAE Ambassador to Pakistan. The UAE minister highlighted the bilateral cooperation between the two countries. It was the first time that UAE’s military participated in a Pakistan National Day parade. It earned the deep appreciation of Pakistani military officials. Informed sources told Gulf News that the visiting UAE delegation would also meet senior Pakistani officials and explore ways and means to strengthen defence cooperation. The UAE’s participation reflected the fast growth in defence cooperation between Pakistan and the Arabian Gulf nation. It may be recalled that on March 6, Chairman Joint Chiefs of Staff Committee, General Zubair Mahmood Hayat, had visited Abu Dhabi’s Wahat Al Karama, the national landmark built to immortalise the sacrifices of the UAE’s brave heroes. General Zubair had been accompanied by Shaikh Khalifa Bin Tahnoun Bin Mohammad Al Nahyan, Director of the Martyrs’ Families’ Affairs Office at the Abu Dhabi Crown Prince’s Court.